Church Of Nativity In Bethlehem Under Restoration Amid Christmas Celebrations : Parallels The Church of the Nativity in Bethlehem is more than 1,500 years old and in the midst of a large restoration project, cleaning grime off mosaics and giving the church its first face-lift in centuries. The mosaics in the Church of the Nativity date to the 12th century. The church marking the traditional site of Jesus' birth is getting an estimated $19 million makeover. A layer of grime collected over the centuries has now been cleaned off, revealing dazzling mosaics from the 12th century. 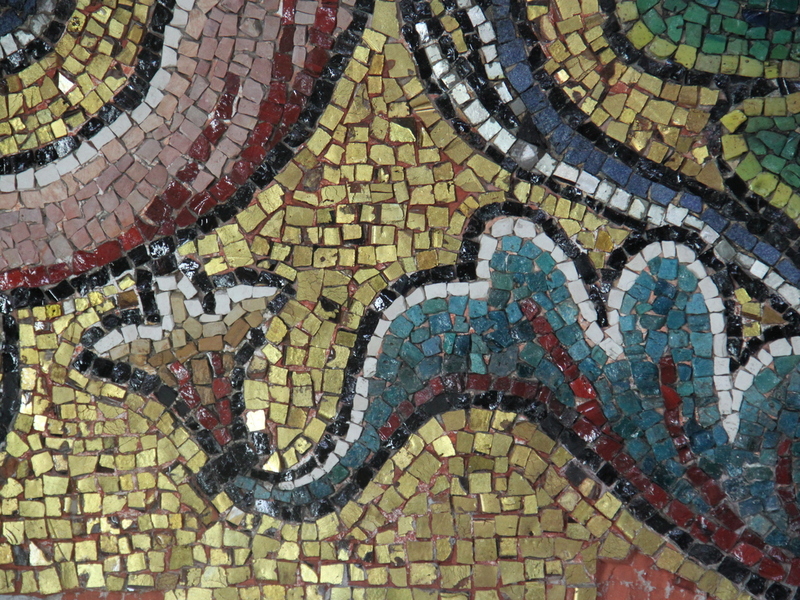 The mosaics feature mother of pearl and tiny tiles of stone and glass with gold and silver leaf. The Church of the Nativity, in the Palestinian city of Bethlehem, is one of the world's oldest continually operating churches. The building hadn't undergone major repairs since 1479, and in recent years, Palestinian officials warned about the risk of collapsing beams. The United Nations declared the church an endangered World Heritage site in 2012. Restoration work began in 2013, including stabilizing and waterproofing the roof and installing new windows with UV protection to protect the wall mosaics. The project is being financed with donations from the Palestinian government and private sector, the Vatican, the king of Morocco, and countries and churches around the world. 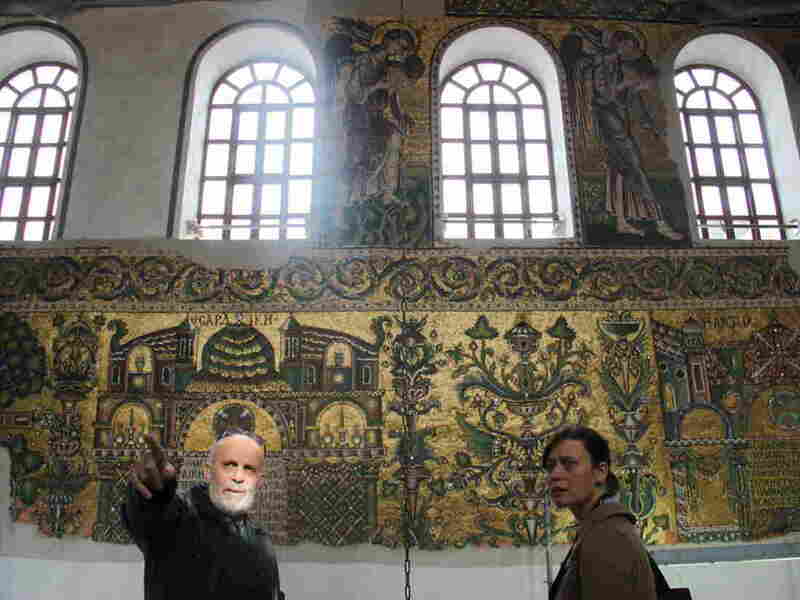 Last year, an Italian team began restoring the wall mosaics, which are made up of thousands of tiny tiles of stone and glass, many shimmering with gold and silver leaf, alongside inlaid mother of pearl. The artist, Basilius, signed his name in Latin and Syriac — using tiles. 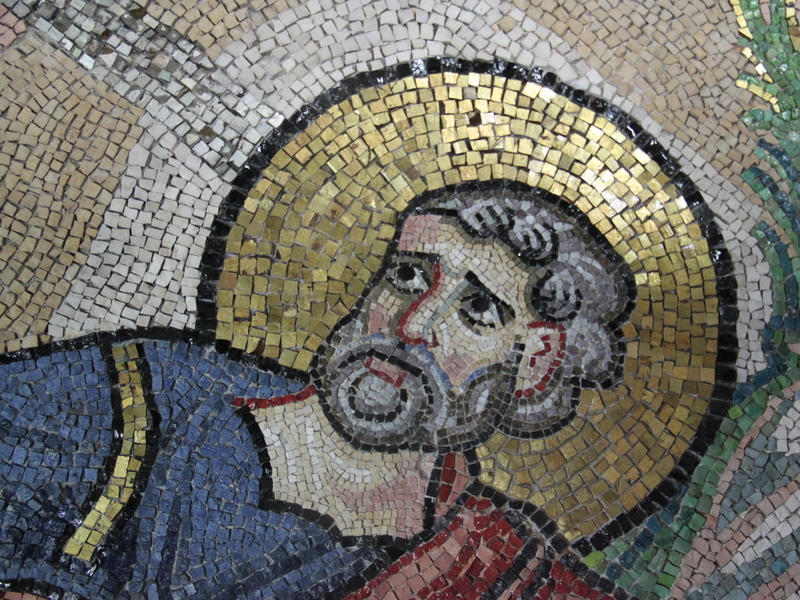 Jesus' forebears are depicted in the wall mosaics. The mosaics depict Jesus, the Twelve Apostles, saints and angels — including one angel the restoration team discovered hiding behind plaster. Engineer Imad Nassar, a Palestinian Christian from Bethlehem and technical manager for the Nativity Church restoration project, guides a journalist in the church. 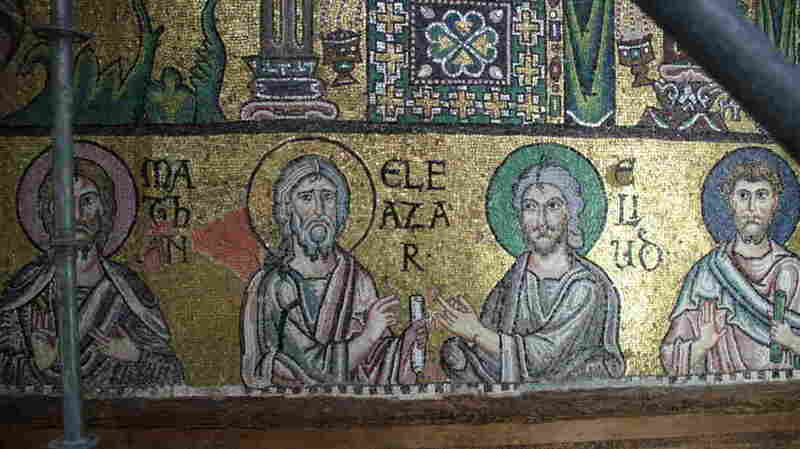 After months of negotiations, the three Christian denominations that jealously share custody of the church finally replaced the candleholders so smoke would no longer rise to the ceiling and leave a layer of soot on the mosaic tiles. 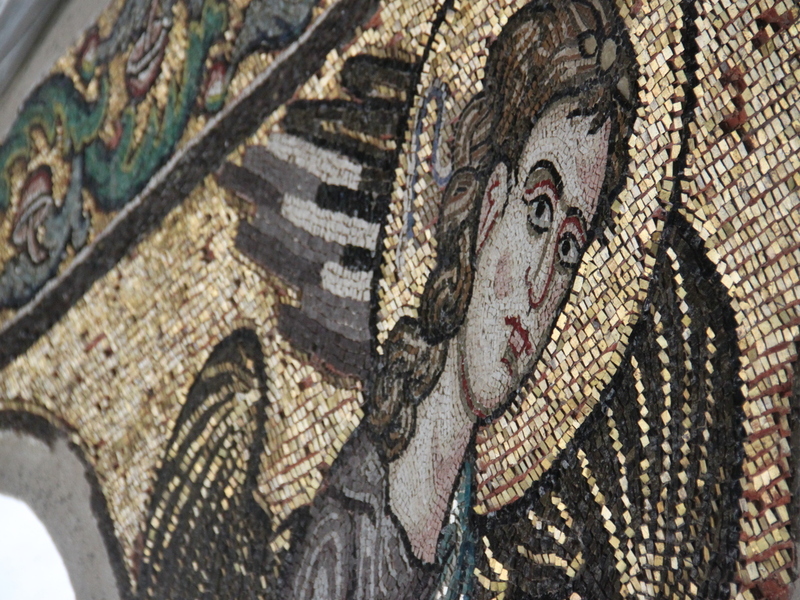 During the restoration work, this mosaic angel was discovered hidden under a layer of plaster. When that happened a few weeks ago, the restoration team removed plastic sheets that had been covering the art. 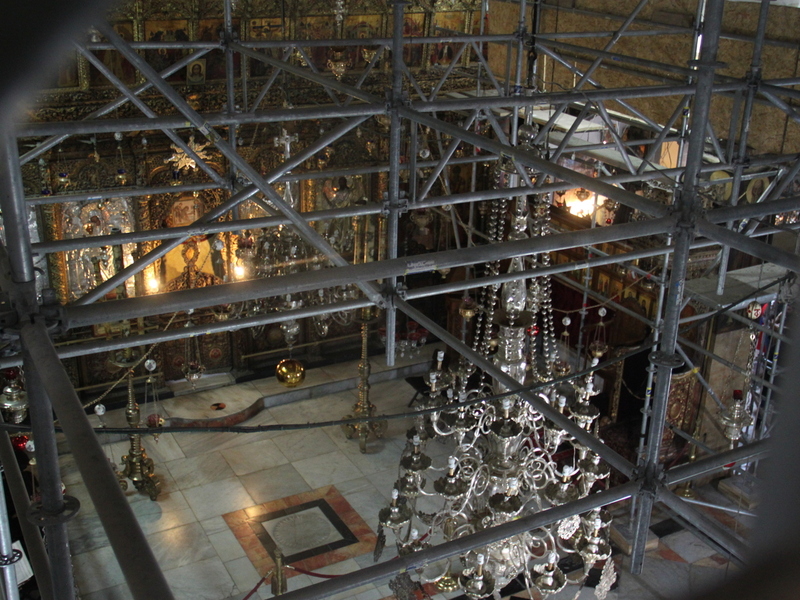 The interior of the Church of the Nativity is in the midst of a major renovation.